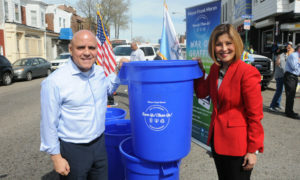 Freeholder Susan Shin Anglo joined city leaders and local business owners on April 9th to help with a cleanup of the Mt. Ephraim Avenue commercial corridor and eliminate graffiti. The event was an extension of the city’s “Team Up! Clean Up!” clean campaign aimed at improving the quality of life along Camden’s business districts and within residential neighborhoods. Elected officials joined code officials and public works staff to provide literature, code information, recycling resources and trash bins to property owners, businesses and residents.